Cleveland Browns vs Giants pre-season game in NYC – Join the Browns Backers, August 9th! Our beloved Cleveland Browns will be kicking off the pre-season versus the NY Giants, in our own backyard, at MetLife Stadium in East Rutherford, NJ. Join the Big Apple Browns Backers of NYC and other New York City based Browns fans for the game as we cheer on the defening pre-season champions! WHEN: Thursday, August 9th at 7pm. The bad news: the Giants do NOT do group ticket sales as 90% of their tickets are held by season ticket owners. The good news: tens of thousands of tickets are available through Ticketmaster and Stubhub for really cheap since these same season ticket owners don’t care about preseason football. Will there still be a watch party at the bar? NO! The Cleveland Browns haven’t played in NYC since the 2015 season. Get out to the game and show everyone that the Dawg Pound is well represented in the Big Apple. The Big Apple Browns Backers of NYC will be hosting our 2018 NFL Draft watch party on Thursday, April 26th at 7:30pm at our official viewing location, Brother Jimmy’s Murray Hill. Everyone knows the NFL Draft is essentially the playoffs for Cleveland Browns fans. It’s the one night where we can forget our terrible losing record the year before and have delusional visions of grandeur about how this draft class will finally be the one to lead us to greener pastures. Come join us on this special night as we irrationally chant “SUPER BOWL! SUPER BOWL!” and watch us draft two QBs with the 1st and 4th picks. Just head down the steps to the basement level where you’ll enter our Cleveland safe-haven, with over 12 giant TVs and projectors, lots of seating, a full bar and a team of dedicated waitresses. Effective immediately, we’re moving our location from Union Square to Brother Jimmy’s Murray Hill and re-branding as the Big Apple Browns Backers. We’re still your home for all future Cleveland Browns, Cavs and Indians watch parties in New York City, but we’re getting a well deserved upgrade and face-lift. We’re also the same folks running the show — Noah, Sean, Lexi and yes, the beloved Shot Penguin. Formerly the Union Square Browns Backers, we are using this opportunity to better serve Cleveland sports fans in the Big Apple. Over the past 7 years, we’ve grown to become THE destination for all Cleveland sports in NYC, with crowds topping 700+ for Cavs and Indians playoff games. Thank you, the fans, for all your dedication and support. 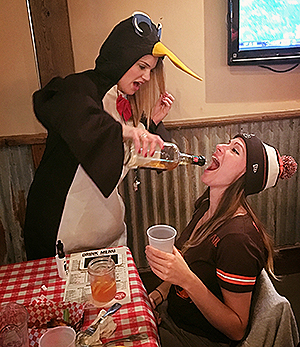 Because of this, our loyal friends at Brother Jimmy’s Murray Hill have renovated their massive basement just for us to create a Cleveland safe-haven for our fans: a full bar with familiar bartenders, full-menu & dedicated wait-staff, 12 TVs plus 2 projectors, full audio, and Cleveland-only food & drink specials. For Cavs and Indians playoff games, we’ll have the entire bar and dining areas, upstairs and downstairs. 1 – Tell your CLE friends that we’ve moved. The Union Square Brother Jimmy’s location is permanently closed to all business. 2 – Give us a positive review on Google. We really appreciate this one. If you feel so kind, give us a positive review on Facebook as well. 3- Follow us on Facebook, Instagram and Twitter. We won’t spam you with nonsense, but it’s the best way to stay informed about watch-party announcements and the occasional dank meme when applicable. 4 – Officially join our chapter. It’s 100% free and takes 5 mins to join through the Browns Backers Worldwide website. Cleveland Browns losing at record breaking rate. How bad is it? No one denies that the Cleveland Browns have been painfully bad over the past several years, but you might be surprised by the historic level of just how bad they’ve truly been. If only someone put together all the embarrassing and mind-boggling stats about the Browns’ ineptitude in a single article? Oh wait, Pat McManamon from ESPN did just that, highlighting the “path of misery” Cleveland Browns fans have been led down. As the largest Browns Backers chapter in NYC (and possibly the country), and arguably the best Cleveland Indians and Cleveland Cavs bar in all of New York City, we’ll always be around to support our Brownies every Sunday — even though they’ve driven most of us into fits of alcoholism and rage. The Browns are 1-29 in their past 30 games. That’s the worst 30-game stretch in NFL history. The last time the Browns won was Dec. 24, 2016, over the Chargers. Before that, they won on Dec. 13, 2015, against the 49ers in which Johnny Manziel played quarterback. The Browns have not won a road game since Oct. 11, 2015. The Browns are 4-44 dating to late in the 2014 season. They have started 0-11 for the second season in a row and are only the second team in NFL history to reach that dubious distinction. Since 1999, the Browns have had two winning seasons and one playoff game, which they lost in Pittsburgh after they led 33-21 with 10 minutes left. The Browns’ overall record since 1999 is 88-211, a win percentage of .284. For the rest, be sure to check out the full article over on ESPN. Imagine if the Browns were a mediocre football team, or God forbid a playoff contender — fans would come out of hibernation in full force. At the beginning of every NFL season, our ranks swell to 400+ rabid Browns fans on Sundays. By Week 16, you’ll find our chapter President, VP and our shot-penguin crying alone into an empty bottle of Jack Fire. But fear not Browns fans — if you’re ever in NYC for a weekend, or call New York City your home, we’ll be around every Sunday offering a friendly shoulder to cry on and a cold beer to wash away your pain. Head on over to our official viewing location: Brother Jimmy’s Murray Hill, 181 Lexington Ave. The Cleveland Browns are heading to Los Angeles to play the Chargers on December 3rd, 2017. This is the first time in over 20 years the Browns have played in LA. The LA Browns Backers, our beloved West coast ‘sister chapter’, are hosting a welcoming party the night before the game — on Saturday, December 2nd. The event will be held at St. Felix Hollywood, the home of the LA Browns Backers, and serve as the official Browns Backers Worldwide party for all of Southern California. They have announced that Cleveland Browns legend Eric Metcalf will be their special guest at the party, meeting with fans and signing autographs. >> Full Details & Event Tickets purchasable online can be found here. Big Apple Browns Backers of NYC Invade London! Several members of the Big Apple Browns Backers of NYC made the journey from New York City across the Atlantic to jolly ‘ol London, England for the Cleveland Browns Week 8 game versus the Minnesota Vikings. Highlights included Browns owner Jimmy Haslem pouring beers behind the bar at the Browns Backers party on Saturday night, spotting Browns legends Hanford Dixon, Josh Cribbs and Jim Brown, and what turned out to be a beautiful day for football at Twickenham stadium (despite the loss). Check out our photo album featuring the best of our member’s pics from the weekend long festivities and game day. Our friends over at the Brooklyn Browns Backers have kicked off their 2nd annual fundraiser, this year benefiting the millions of Puerto Ricans left devastated by Hurricane Maria. They’re running a raffle, with lots of amazing Cleveland Browns related prizes. The raffle will be held at halftime of the Browns vs Jaguars game on November 19, 2017. Full details below. Tickets can be purchased online at any time. When they see a new payment they’ll fill out the corresponding number of raffle tickets and toss them into a hat. You don’t have to be present to win, but it is recommended that if you’re after a specific prize you send a representative to choose and take home your item home. Someone will text or email winners if they aren’t present. Prizes are awarded on a 1st draw, 1st pick basis. Once again… it’s easiest to claim a prize if you’re present. You can see all 13 prizes by viewing this Facebook photo album. One prize, the Little Browns water bottle, will be completed at the BBQ on 11/11, where members of the 2017 Little Browns flag football team (whom have actually won some games, and are awesome to cheer for) will autograph the bottle. Questions? Email Rich Garr, Brooklyn Browns Backers’ President.